Located in the municipality of Adolfo Alsina , it is considered a historical place and natural area. The main feature of Carhué is the Epecuén Lake Hydrothermal Center . The water of the lake are very saline, the proportion is 10 out 1 compared to sea water . The combination of large doses of sulfate and chloride places it at the top of mineral waters. Chemically they are considered as clorate, sulfate, alkaline, sodium-carbonated, iodonized and bromide. The heated pure thermal bath relaxes the muscles, added to the articular discharge and the flotation effect, in marine waters the body is allowed to relax. Thermal therapy is a natural complement which alleviates, cures or rehabilitates affections like articulation illnesses, breathing, skin deseases, ear illnesses, throat conditions; being also useful in sports medicine . They are in Pedro Luro town, Villarino district at the southeast of the province. The waters flow from 966,50 meter deep, at a temperature of 70º C at the top of the well. The well isinside the Thermal Hotel, where one can stay. There are rooms for the treatment of different conditions. 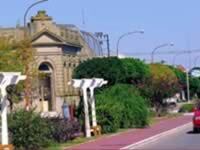 The access to Pedro Luro is along the national route Nº 3 or by up to Bahía Blanca , then by bus or car. They are in the south of the Patagones district. There is a hotel which is open the whole year. It has a closed bath for public bathrooms. The temperatures are regulated according to the external temperature. The water has healing and anti-stress properties. The hotel has 15 rooms with capacity for 40 people. Technical : Covered pool, jacuzzi, immersion bañaderas, fangoterapia in booths, masoterapia, kinesioterapia, gym, treatment cosmetológico. Therapeutic use : Respiratory system, digestive system, apparatus locomotive, skin, relax, aesthetics.